Mr. GU Shengzu, Vice Chairman of the National Committee of the Chinese People's Political Consultative Conference (CPPCC) and executive vice-chairman of the Central Committee of the China National Democratic Construction Association, paid an inspection tour to Xishuangbanna Tropical Botanical Garden (XTBG) on April 6. His tour is mainly to have a general understanding on the tropical plant research, public education and tourism of XTBG. 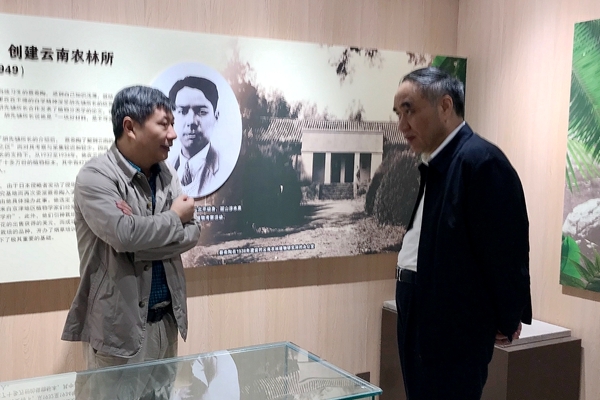 Prof. Chen Jin, director of XTBG, accompanied the CPPCC vice chairman touring the living collections and research facilities. He reported the development of XTBG, especially on Prof. CAI Xitao (founder of XTBG) and achievements in species preservation, scientific research, public education, tourism, and international cooperation. Mr. Gu Shengzu gave high comments on XTBG development and the scientists working in this remote area. He also encouraged XTBG to make greater contribution to local development and ecological civilization. He also expected XTBG to make more important contribution to green “Belt and Road” initiative, after listening to report on work of Southeast Asia Biodiversity Research Institute (SEABRI) and ANSO Botanical Gardens Union (ANSO-BGU). Mr. GU Shengzu’s tour to XTBG was part of his work to investigate poverty alleviation and other work in Xishuangbanna.